Krivi is a man on a mission but his mission is jeopardized when he falls for his target, Ziya who is assumed to be the sister of the elusive terrorist known as the Woodpecker. Will love win over Krivi's responsibility towards his country? Is Ziya truly a terrorist's sister? The story spans their journey of love, responsibility and the ultimate sacrifice. 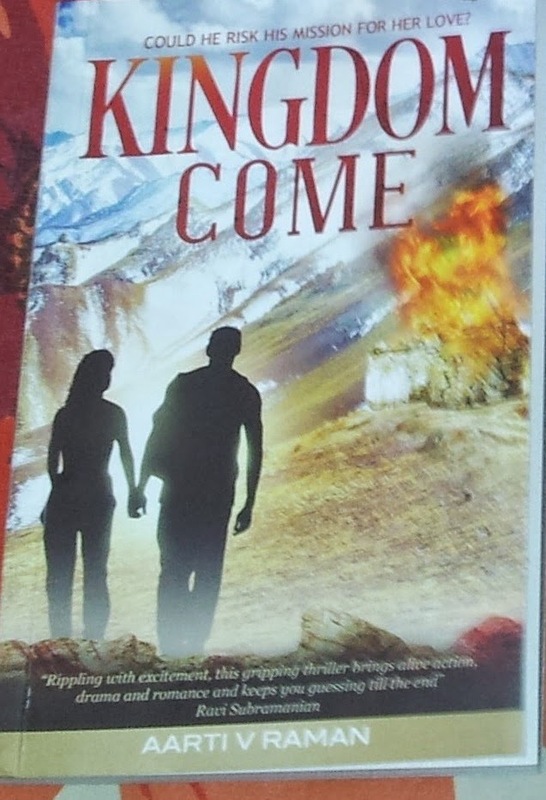 Fast paced story, power packed moments and strong characters keeps the reader sitting at the edge of his seat while reading Aarti's book, Kingdom Come. A tightly plotted story with in-depth research of the lives of the soldiers, their missions, their family commitments and their willingness to sacrifice everything for their country makes this story a pleasure to read. The cover art is appealing and the title is very unique. Both these things catch the attention of the reader. The spot on description of army procedures or the life saving procedures employed by the army gives us an insight into the minds of these brave men and women who risk their lives daily so that others can live free and safely. The poignant and heart breaking reality of the families who send their sons, daughters, brothers, husbands etc. to serve their country is also beautifully painted in the book. After reading the book, I have a renewed respect for the army and the people who work day and night to keep us safe. Hats off to the author for thinking and then writing such a difficult book. The characterization is noteworthy and the author gives us people who are complicated and flawed with their own share of mistakes and wrong decisions but still they are able to win our hearts and connect with us due to their actions which speak of their inherent goodness. Krivi and Ziya are both difficult characters to sketch and execute but they were so flawlessly portrayed in the story that they instantly made themselves dear to me. The romance between these characters and their feelings are equally complicated and gives the reader a new perspective to the human nature. Noor and Sam, Ziya's friends and only family, symbolize all the good and honest people in the world who are in love. Their love and devotion makes one realize how fortunate one is to have people who love them in their lives. Dada Akhtar was a cool and very homely character and I could easily visualize myself living with him, laughing and enjoying the beauty of Kashmir. The villain, the Woodpecker, is a character that instills fear in the readers' hearts and also brings out a deep hatred towards such criminals who kill innocent people just for fun or money. The story is divided into three parts and maintains its pace according to the demand of the story. With high drama, intense action, sensuous romance and a goosebumps inducing villain, Kingdom Come is a must read and deserves a full 5 on 5. Go buy, read and enjoy this great story by the very promising author, Aarti V. Raman. "...the sun rose over the Kashmir valley, where people went about their business, where death walked amongst the living, and the living went on. Because nothing could defeat death, like life..."
I received the book from the publishers and I am very thankful to them. The above review is my honest and unbiased opinion and in no way influenced.